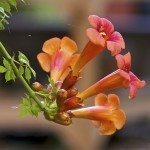 Golden trumpet vine is a common sight in gardens with year-round warmth and plenty of sun. These needs make growing Allamanda indoors ideal where there is good southern or western exposure. Even the northernmost gardener can enjoy an indoor Allamanda flowering vine. You may have to invest in a good plant light and turn up the thermostat, but it’s worth it to bring the rich yellow flowers and lovely formed foliage. Allamanda plant care is similar to most tropical houseplants and can be mastered with a few tricks. Allamanda is native to northern South America. As such it requires high light, consistently warm temperatures and humidity of at least 50 percent. These conditions are hard to simulate in the average home without grow lights, humidifiers and heaters. 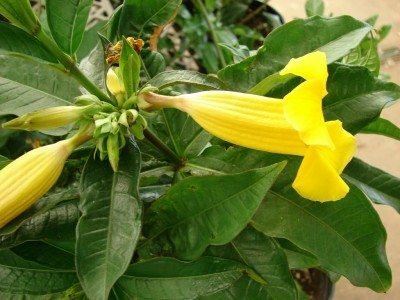 Greenhouse conditions are often ideal for Allamanda plant care. Indoors, we tend to have less moisture in the air and sun doesn’t penetrate the interior for as many hours as the plant needs. You can overwinter the vine and bring it out into the bright rays of light in spring and summer. There golden trumpet houseplants can recharge and produce the amazing bright yellow 5-inch blooms characteristic of the Allamanda. It can be quite tricky to mimic the native growing conditions of golden trumpet plants as indoor specimens. Indoor Allamanda flowering vine needs structural support for the rambling stems. You can keep it pruned for a more compact plant. Good care of Allamanda golden trumpet starts with the planting medium. Use a potting soil with equal parts peat, compost and sand. Golden trumpet houseplants need four hours or more of direct bright sunlight. The container should be at least a gallon with drainage holes. An unglazed pot is best since it will promote evaporation of excess moisture. Place the pot on a saucer filled with pebbles and water. This will create a humid atmosphere which is required for a healthy Allamanda. You can also use a humidifier. Keep the plant away from drafty doors and windows and several feet away from a heater. Water deeply until the excess moisture runs out of the drainage holes but then wait until the top surface of the soil dries out before you irrigate again. Allamanda doesn’t like wet feet. 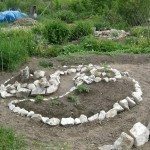 Fertilize in spring through summer every two to three weeks with a good blooming plant food. Allow the plant to rest in winter. 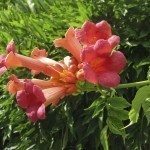 Suspend fertilizing in winter as part of good Allamanda plant care. Restart fertilizing in April and move the plant outside as soon as temperatures are above 60 F. (16 C.). Prune in early spring and cut stems back to pone to two nodes to promote tighter new growth. This plant is prone to spider mites and whiteflies, so watch carefully for these pests. At the first sign put the plant in the shower and hose off as many of the little guys as you can, then follow with daily applications of horticultural soap or a Neem spray. Read more articles about Golden Trumpet.